The Kardashian clan have reportedly cut ties with Scott Disick after his very public flirtations with six younger women. 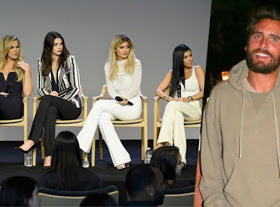 According to TMZ, the famous family are convinced the 34-year-old’s actions are part of a plan to make his ex Kourtney jealous, following her new romance with Younes Bendjima. The clan are said to be outraged by his steamy displays with Bella Thorne, Sofia Richie and a number of other models, as they fear the photos of his antics will one day be seen by his and Kourtney’s three children. Scott has certainly set tongues wagging over the last week, after he appeared to flirt up a storm with six young beauties in Cannes and Monaco. Sisters, Kourtney Kardashian and Kendall Jenner photographed while showing off their toned bodies on board a yacht at Cap d’Antibes. More photos after the cut. For the first time since Kim Kardashian’s Paris robbery, the reality TV star was at the Elle DeGeneres Show where she spoke about a lot of things, the Paris robbery attack she suffered being one of them. 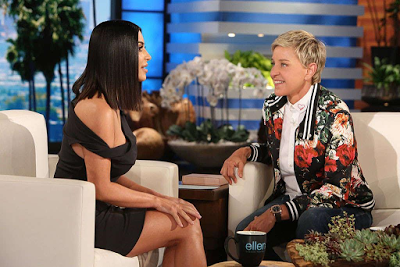 Kim revealed the Ellen that she felt the robbery was meant to happen to her just to teach her not to show off so much. She said there was nothing wrong with being excited about something you worked hard for and wanting to show it off, but she said with the robbery experience, she is now less materialistic and doesn’t care so much for expensive jewelry. She went on to reveal that she likes the new person she has become, courtesy of the horrible experience and expressed her gratitude that her kids will get to see the new her and learn from her. At Ellen’s request, Kim recounted her experience on that horrible night in Paris last year. With a shaky voice and tears in her eyes, she told of how she felt, thinking those were her very last moments. previous “natural” photoshoots have been heavily Photoshopped. Fans were quick to turn on Kim, who “broke the internet” two years ago with a picture of her balancing a glass of champagne on her bottom, for constantly flaunting her “fake body parts”. She said: “I’ve seen perspective is a b****. I’ll work on taking videos with better lighting & angles. F*** you.” She deleted the post one minute later. “Kardashian’s Instagram post made the photograph immediately available to her nearly 67 million followers and others, consumers of entertainment news — and especially news and images of Kardashian herself, as evidenced by their status as followers of Kardashian —who would otherwise be interested in viewing licensed versions of the photograph in the magazines and newspapers that are plaintiff’s customers,” the company said in a statement.